BioWare is watching you play Mass Effect 2, and it's learning a heck of lot from it. BioWare is collecting player feedback from Mass Effect 2 in order to make Mass Effect 3 better. You don't need to do anything to contribute though, apart from play the game while connected to the internet. BioWare seeded Mass Effect 2 with dozens of tiny events that would let it collect information on things like the classes that people picked or how many of the game's conversations they skipped. Casey Hudson, the series' Executive Producer, said that the information gave BioWare a window into how people were playing the game and how the company might tweak things for the sequel. For example, the soldier is by far the most popular class, and Hudson said that knowing that allowed it to start asking the right questions about the design process for ME3. "More people played the soldier class than all of the other classes combined," he said. "If you know that, then you can start thinking about future games. Is that good? Is that a problem? Should we look at the other classes and start thinking about ways to make them selected as often as soldier? As part of asking these questions, we can design games in the future a lot better." In some cases the data allowed BioWare to confirm it was on the right track, as with the very low rate of skipped conversations - just 15 percent - but sometimes the information, which Hudson stressed was entirely anonymous, yielded some unexpected results. 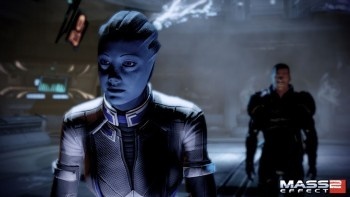 Hudson said he had been surprised to learn that more than half of all players had imported a save from the first Mass Effect, and that PC players did fewer loyalty missions than Xbox 360 players. Hudson noted that there was also a difference in which of the games loyalty missions PC gamers did, versus those done by 360 gamers. PC gamers were apparently much more likely to try and secure Miranda's loyalty, whereas 360 players favored Grunt. BioWare isn't the only developer pulling in data from its games, Rockstar did something similar with Red Dead Redemption, and published the results as part of an infographic back in July. While the method of collection has a faintly "Big Brother" vibe to it, it must be supremely useful developers to be able to get information on how people are playing a particular game with such a high degree of accuracy. Interpreting and acting on this kind of information takes time however, so don't expect to see it used to tweak the PS3 version of Mass Effect 2 that comes out next year.